Just A Car Geek: Anyone Know What This Is? Just a Car Geek reader "JM" sent me this picture. His email was short and to the point: "Does anyone know who made this and what it is?" My guess is it's from Russia, or at least the Eastern Block. I have a close cousin of it (in both overall styling and purpose) in 1:43 diecast, and mine is a GAZ Start Minivan. Wonder if it's a GAZ Something Else? Never seen one before ... a real mixed bag ... headlights look like 57/58 Dodge/Plymouth, as does the side trim from the front to the rear wheel arch? front bumper ... at least in each corner almost like the turn signals of a 58 Pontiac ... but the space in between is different ... I'm stumped. 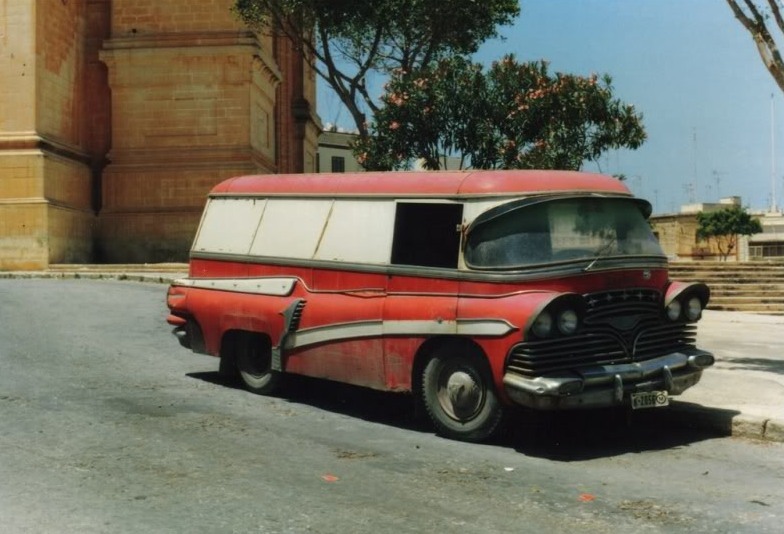 After more than 3 years of discussion, the most likely answer is that it is a highly modified Bedford van (J2 minibus). If you run a reverse image search in Google (simply drag the image into the search bar, or upload a saved file) you can see that this thing has made the rounds on a number of websites including hooniverse, jalopnik, autoweek, etc. Looks Cuban, but the license tag is wrong. Phillipine "Jeepny" perhaps? I can't say I had ever heard of Google's reverse image search, but having tried it out, it works. As I've thought before, Google is pretty amazing. So, thanx for that tip, Garrett. I'm glad there's a best educated guess on what this beast is, as I had no clue either what it could be. A mistake...but a cool one. Someone from Pixar's CARS III... Vlad' ? Don't know what that is but I sure want one!! The baby of the Oscar Meyer wienermobile.